In 1927, the Right Hon. Raoul Dandurand, a lawyer and Canadian senator, said that Canada and defacto the United States were “a fireproof house, far from the sources of conflagration.” The longtime politician was noting our geographic distance from Europe and that continent’s history of conflict. However, the events of 9/11 demonstrated that the United States was no longer exempt from the direct impact of a spillover of terrorist violence. And this week’s incident was a reminder that neither is Canada. Domestically, the Royal Canadian Mounted Police (RCMP) and the Canadian Security Intelligence Service (CSIS) have identified a small but notable number of radicals whose extremist words stand in contradiction to our way of life and our democracy. However, in free societies, such as Canada, words no matter how controversial are not a crime. Indeed, even suspected terrorists are entitled to careful protection of their rights and are accorded due process of law. Herein lays the paradox we face – the very qualities that make our society worthy of preserving are the very things that may be corrupted and exploited by those who wish to harm us. Of course, terrorism is hardly a new phenomenon. However, the problem of how best to confront terrorism continues to confound our society. The threat of violence against the state and ultimately its people, will, if unchallenged, undermine its very existence. The problem for our democratic society is how best to challenge those who would use violence against us, without disregarding the rights and liberties which we all share. Successful terrorists have effectively used our freedoms to their advantage in the past. For proof, one need look no further than the events of September 11, 2001. The 19 al Qaeda terrorists were able to move about the United States unobstructed for months before the attack. However, the dilemma facing the United States and all free nations has not changed from that fateful day, namely, how do we address the legal prevention and avoidance of terrorist acts without resorting to illegal or anti-democratic means? In Canada’s case, this past week’s attacks suggest there are three responses we should be considering. For a start, Canadians will have to view security differently – there must be a cultural change. Security must be viewed as a necessity, even if that security alters the relationship between the parliamentarians and their constituents. There must be strictly controlled access points and visitors must be more careful scrutinized. In regard to the security services on Parliament Hill, where this week’s attack took place, there is no single command and control structure – there are four agencies responsible for security in the Parliament. Either greater communication protocols must be established between these services, or a single command structure with jurisdictional authority for security must be established. Finally, greater vehicle restrictions have to be implemented on the Hill. 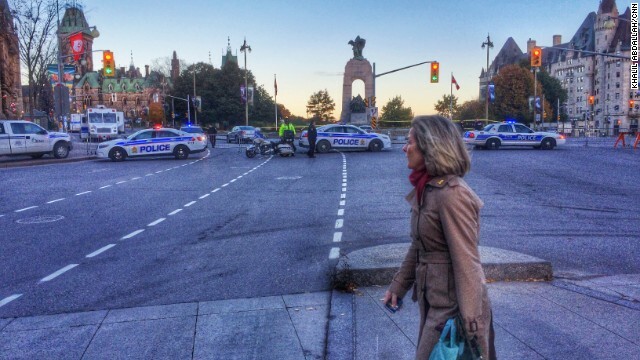 Open societies such as Canada are especially vulnerable to acts of terrorism. Our openness permits would be terrorists to develop here at home or cross our borders and move about freely without fear of arbitrary arrest or detention. Vigilance, constant and unwavering, is the price we must all pay to keep our nation and our world safe from those who would use violence, or the threat of violence, to coerce, or intimidate us into changing our way of life. Open societies? Canada in fact may be more open than the United States and they certainly are more financially stable. Canada is not like us. One crazy person is not going to turn them into people who see enemies around every corner. They should have let this guy go to Syria and join others like him. What we should do but not likely is every time some guys want to fight someone like the Syrian government perhaps we should check them out before we train and arm them. The good old foreign policy working for us again. These guys in Washington should try and run their own government. Well put, Allan. Had the Canadians done the right thing and stayed out of this stupid war, supporting the U.S. agenda in the Middle East, they wouldn't be facing this dilemma today. Lol @ Allan those guys in Washington should do SOMETHING....he!! anything would be a new experience for us all to see for a change. It's been established as not true that Michael Zehaf-Bibeau said he wanted to go to Syria. His Mother told police he wanted to go to Saudi Arabia – and police have now admitted they told the public the wrong information. Now, it could have been accidental – but in this country we have a government anxious to steal from the playbook of Bush, Blair, Rove, and Rumsfeld et al. With an election less than a year off and the currently reigning party down in the polls, it's tactical to create fear amongst the Canadian populace. Then, they can claim to be the only party who can protect us. It's awfully transparent. And, it's especially ugly in view of the tragic deaths this weekend. The deaths of our soldiers are being exploited for political ends. Yes, I know, it's been done and seen before. It's still a travesty piled onto a tragedy. Lack of security is not what protects a democratic form of government. Knowledge that the USA has citizens and visitors who are mentally ill or violently opposed to the USA does not qualify as paranoia. An "open society" would be sweet, but remember the White House fence. I agree @ Adrian 22, it IS a travesty! Fearmongering became quite popular by politicians after 9/11 and so they continue! Especially as this is election year! And war makes politicians rich so i dont see them discontinueing that policy anytime soon. You nailed it good, chrissy. Thank you. I particularly like the way Congress is at a standstill because, you know, they must wait until the mid-terms are over until they can get back to their normal level of intransigence. Lol @ banasy...theyve been at a standstill for nearly 8 years havent they?? When law no longer protects people from the pursuits of individuals, corporations and governments it is called fascism. To protect the people the courts must overturn the efforts of the affect of money and influence on the law. When this is obstructed but I repeat myself. How many people die per day in homicides in the US? Michael Zehaf-Bibeau killed Corporal Nathan Frank Cirillo and injured Samearn Son. While we should honor both of these men, keep things in perspective. One shooting does not mean we have to throw civil rights out the window in the name of security.